Rolf Suey - Better Late Than Never: Investing in Stocks – Isn't it Risky … Any Tips? More than a week ago, I attended a half-day SAF call up. I expected familiar faces, but there were none. While heading to car park after course ended, I saw one familiar camp mate. The course ended early so we decided to go for coffee. While chatting, I was queried on my current interest, I said “investment in stocks”. I began to explain fundamental analysis and some essential financial ratios which are necessary to pick a stock. Somehow, I manage to convince (or “confuse”) that I am humbly more knowledgeable than the general public. By and large, these are the two most commonly asked questions I faced. The "risk" question normally comes from people who had almost no knowledge in investment. The "tips" question usually comes from people who have little knowledge of investment and nothing more than just the ability and experiences of buying and selling some stocks! This group is reluctant to spend time and effort to research and hope to reap quick returns. Is investing in stocks really risky? 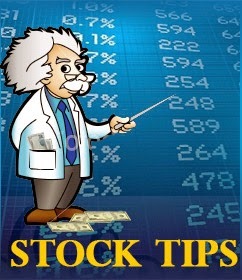 Is stock tips really useful for someone who lack investment? For most people, investing in stocks is no different from gambling. You often heard “do not get yourself burn in stocks” literally means losing your fortune in stock investments! To me, investing in stocks is comparable to gambling only when you lack the necessary investment knowledge and have no idea what and why you are buying. There are neither plans nor strategies. A good investment in stocks often requires extensive research using top-down and fundamental analysis. The pre-requisite of stock purchase is “Research”! Essentially, you require research not only in the company and the sector it belongs, but also on "big picture" such as economic and political factors that affects performance of the company. Knowing the impact of "big picture" is important. For instance in a rising interest rate environment, companies with high leverage will be more adversely affected than those with low debts. The current political turmoil in Thailand is bound to have undesirable effect on companies dependent on its economy. Singapore government aggressive immigration policy in raising the population last few years, led to the construction and property industry experiencing one of their best periods! Also if you are interested in a particular retail REIT say Fraser Centrepoint Trust, you can visit the shopping malls (North Point, Causeway Point, Bedok Point etc) within the REIT to see for yourself if the shops are doing well, or if it has good human traffic. If you are sick, you can also visit Raffles Medical Group to see if they provide value for money healthcare services. Do you buy a stock after a tip off? Do you buy a stock because everyone is buying? Do you perform in-depth research of a stock prior to purchase? If the answer is yes, you are probably “Herding”. Herd behavior in investment is a mentality characterized by the lack of individual decision-making or thoughtfulness, causing people to follow the majority in their investment decisions, often after hearsay and acting without any plans. Herd behavior is irrational and driven by emotion, often cause by the fear of regret of missing out on a good investment. "Herding" often leads to frenzied buying (bubbles) or selling (crashes) in the stock markets. The dotcom bubbles in the late 90s and early 2000s is one main example of "Herding". If you buy stocks base on rumors or tips, strong likelihood your emotions will follow the trends of the stock price. When share price rises, you are happy, when it falls, you are sad. Lacking research and analysis on the company means you have no idea whatsoever about the company fundamentals or long term outlook. The focus is only on stock price. When your trades are run by emotion, chances are you often make the wrong buy or sell decision. Conversely, if you buy a stock after extensive research, knowing the strength of its management, its business model and its value, any movement of the share price is likely to have minimal effect on your emotions. Chances are you will have good return of investment in the long run stemming from strong fundamentals of the company. Several years ago, I worked for a listed company. Friends started querying for insider news. Not disclosing any sensitive news, I mention about the general positive outlook of the company, but stressed “buy at your own risk”. Furthermore, I disclosed not owning any shares and have no intention to buy in the short run. Share price rose initially and later price fell in response to dismal financial results. The same time, I was having coffee with friends, when one of them was very angry and put the blame on me for giving him the lousy tips leading to his paper loss! I did not even know he own the stocks and cannot remember when I ever tell him to buy! More than a year later, the company share price did well and my friend sold at a profit. When you buy a stock according to hearsay, you will get emotionally affected when price fluctuates. This often lead to wrong trading decisions. Since I worked in the oil and gas sector, a camp mate asked for tips three years ago. I told him I invested in Vallianz Holdings, since I believe in the long term future of the company and industry. At that time, price is high at S$0.17. He follow suit. Subsequently price of Vallianz keeps falling, while I accumulated more shares to average price down. I still have strong belief of the company. The final nail in the coffin comes during a right issue bringing the price to an all-time low of S$0.05. I subscribe to the rights to mitigate my losses. I not only suffered a paper loss of S$15k, but had to take the blame of culprit of my camp mate losing hundreds of dollars of paper loss. On a positive note, I am still able to sleep well at night though. End last year Vallianz share price rocketed to S$0.17 from its low of S$0.05. I sms my camp mate if he is selling at a profit. Apparently he did not subscribe to the rights issue, which means he still own the stock at 0.17 without any unrealized profits. On the other hand, my average price is S$0.08 resulting in doubling of profits! Although both of us buy at same initial share price of S$0.17, my understanding in the company fundamentals and industry bestows me the confidence to buy more shares even when price is falling, which turn out positively for me three years on. On the contrary, my camp mate has to keep a stock for three years without making any return, after following to a tip. If Investment in stocks is risky, walking high-wire without safety net is definitely suicidal. Nik Wallenda is a daredevil known for his high-wire performances without a safety net. He holds seven Guinness World Records for various acrobatic feats, but is best known as the first person to walk a tightrope stretched directly over Niagara Falls on June 15, 2012. Wallenda says that the high-wire performance is not a daredevil act or a mere stunt, but rather an athletic feat requiring great physical training. "I see a stunt as somebody who gets in a barrel and goes over the edge and hopes they don't hit a rock. What I do is very calculated. 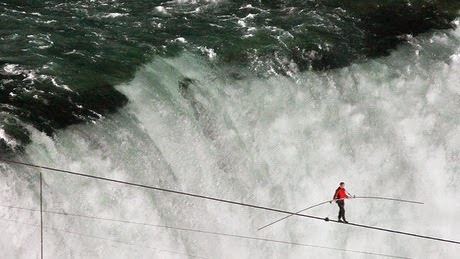 I train a long time for it and I consider it more of an art” - Nik Wallenda commenting on his walk across Niagara Falls. Nik aims to be "over-prepared" for every event he does, training six hours a day, six days a week. He does ten hours of weight training and five hours of aerobic exercise each week. Even so, he says wire walking is primarily a mental skill. It is hence deduced by Nik that walking a high-wire is not risky as long as you prepared for it - likewise for Stock Investments. Investment in stocks is not risky; it is often the ignorance of the investors that is risky. Relying on stock tips alone in investment decisions, will lead to emotional unbalance when stock price fluctuates in the short term, resulting in wrong trading decisions. Extensive research and be "over-prepared" are the pre-requisites for stock investment success.